is a 93-days workshop on different locations in Asia. You will travel, train and tune yourself with ancients philosophies and powerful nature. A great opportunity for those who want a change in life style, recharge their batteries and experience Hinduism, Buddhism and Taoism from the inside. Countries to visit and stay in Asia: Thailand, India or Bali, China. is a 30-days workshop on different locations in Thailand. 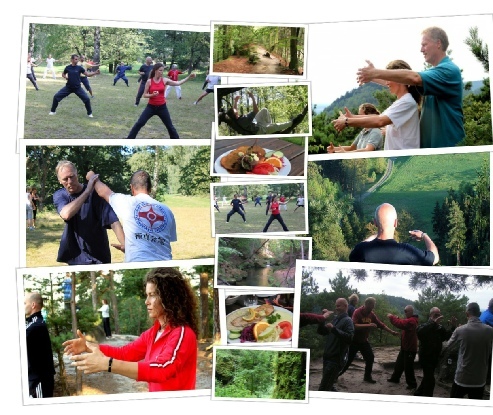 You will travel, train Wuyiquan and Taijiquan and tune yourself with the ancient philosophy and powerful nature. There you can see Buddhist philosophy reflected in daily life and sport (Thai boxing). You will have the opportunity to participate in local courses like Thai boxing, Thai cooking, Thai massage or meditation, which can give you something you can apply in your own life. International Taikiken week workshop - Czech rep.
Can not join our workshops? soft with a factor hard, active in silence, flexible in firmness, deliberately intuitive, subtle freedom guiding, depth, feeling, self-confidence, expressiveness and passion, detached connected, harmony and vitality, openness, felt sense, moved, patience, inner peace, independence, character, intuitively connected, courage, targeted goals, clarity, compassion, giving, care, health, mindfulness, resilience, empowerment, assertiveness, defensibility. Taikiken Natural Tuning - Meditation, coordination and martial art (Taikiken) training. * Price is inclusive accomodation - 6 nights, based on two persons in one room, with meals and training. Traveling expences are not included in the workshop price! Saturday morning training with Taikiken basic excercises, Baduanjin (Qigong) en Taichi. Experience in martial arts or Taikiken is not required, good general health and the motivation to train together is enough. ZenmaX Natural Tuning - to re-grow and empower your original Self. Body Orientated Mindfulness is high impact Self-Empowerment to restore your Selfness in relationships and daily life. Boost up your internal strength depleted by a wide range of habits. 5 full days for € 475,- p.p. 3 full days for € 295,- p.p. 2 full days for € 200,- p.p.